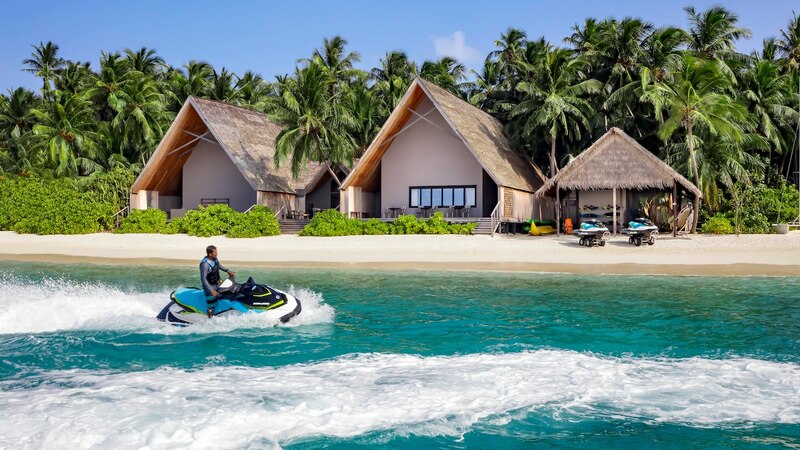 Nestled between footprint-free white sandy beaches and lush rain forests on Vommuli Island only reachable by seaplane in the Dhaalu Atoll, The St. Regis Maldives Vommuli Resort is a five-star luxury resort by The Marriott group. 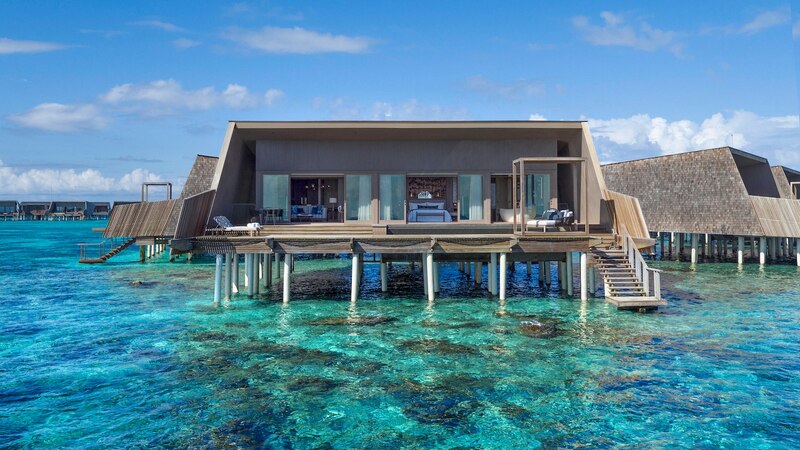 Overlooking the crystal-clear waters of a private lagoon and the Indian Ocean, the exquisite resort boasts an award-winning architectural design inspired by marine life and the local Maldivian culture with notable facilities such as the Whale Bar, with a design inspired by the whale shark, and the Iridium Spa, inspired by the lobster. 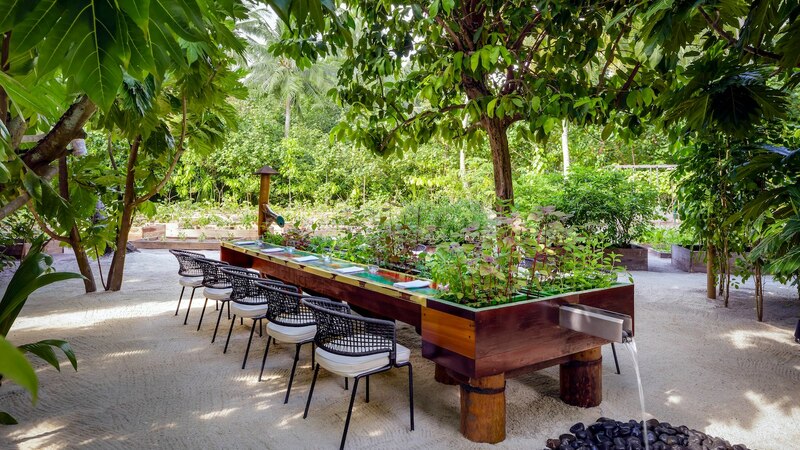 The stunning, eco-conscious and environmentally friendly resort features contemporary design and local craftsmanship with a profound appreciation for the ecological environment. 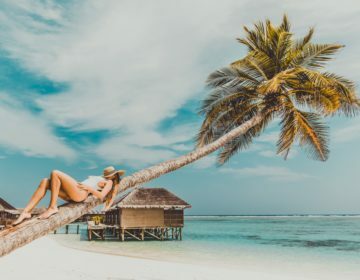 The peaceful retreat has 33 on-land and 44 over-water villas with island-inspired design, refined furnishings, private pools and terraces with picturesque ocean or garden views. 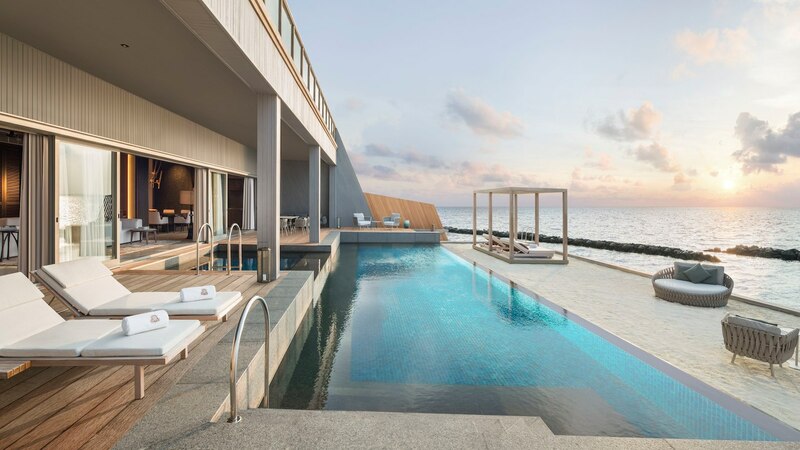 The resort also boasts the largest three-bedroom over-water villa in the Maldives, the John Jacob Astor Estate, with expansive private terraces leading to pristine beaches and infinity pools with the Indian Ocean as a tranquil backdrop inspire moments of relaxation. The St. Regis Maldives Vommuli Resort is home to unrivaled amenities and facilities including six highly acclaimed restaurants and oceanside bars serving globally-inspired cuisine from around the world and an exceptional wine cellar with rare and vintage labels; the exclusive over-water Iridium Spa that offers custom-made treatments and massages, an outdoor infinity pool, and state-of-the-art fitness center; and a wide variety of water sports and excursions, including a diving center. Guests can relax in the St. Regis airport lounge, The Great Room on arrival before being transported to the seaplane in a private chauffeured Bentley. The St. Regis Maldives Vommuli Resort prides itself on exceptional personalized service and hospitality provided by legendary St. Regis Butlers who deliver bespoke service day or night and are on hand to assist with customized recreational activities on the island, ranging from beach yoga and sandbank picnics to deep-sea fishing and dolphin or sunset cruises. Designed to reflect the Maldives’ unique culture, 77 beautifully appointed villas, including 33 on-land and 44 over-water villas, offer comfort and luxury with spellbinding ocean views. Dappled shade from surrounding palm trees falls onto designer villas with spacious en-suite bedrooms, airy living spaces furnished in stylish contemporary décor, and a range of deluxe amenities. Spacious en-suite bathrooms have glass-enclosed rain forest showers and separate deep soaking tubs, pampering Remède bath amenities, and plush bathrobes and slippers. Villas enjoy private access to the beach, beautiful gardens with daybeds, panoramic upper dining decks at treetop level with viewing platforms, and uninterrupted ocean views.Modern amenities abound, including Bang & Olufsen BeoVision televisions and entertainment systems, iPod docking stations, personal bars, and fresh beverages, coffeemakers, air-conditioning, IDD telephones, and complimentary wireless Internet. Exuding elegance and charm with hardwood floors, high ceilings, and sophisticated island-inspired décor and furnishings with colorful accents, Over Water Pool Villas, Garden Villas, and Sunset Over Water Pool Villas have private sundecks with hammocks and sun loungers, infinity swimming pools with floating loungers, and outdoor bathrooms with showers and glass-floored outdoor baths. Villas have direct ocean access from sundecks, and a wealth of modern amenities such as Bang & Olufsen BeoVision televisions and entertainment systems, iPod docking stations, personal bars, and fresh beverages, coffeemakers, air-conditioning, IDD telephones, and complimentary wireless Internet. 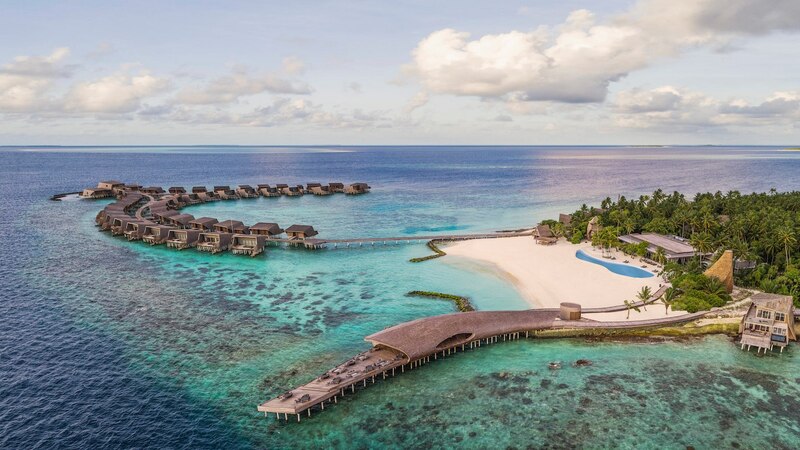 Nestled among the island’s lush, tropical greenery overlooking a private beach, The St. Regis Maldives Vommuli Resort Caroline Astor Estate is a study of luxury and opulence. An indulgent residence of grand design and expansive proportions, the elegant retreat features designer outdoor living spaces and exceptionally appointed interiors that seamlessly merge to create an even flow throughout the property. Designed to be an exclusive island home of privilege and privacy, the 620-square-meter abode boasts three exquisitely appointed en-suite bedrooms, lavish living and dining areas, and a private 88 square-meter swimming pool surrounded by an ample sun terrace with inviting spaces for relaxing and entertaining. Featuring unparalleled views over the lagoon and island surrounds, the ultra-elegant and spectacularly luxurious John Jacob Astor Estate is the most significant water villa in the Maldives and affords every luxury possible. Spanning 1,540 square meters with a 92 square meter infinity swimming pool, the opulent retreat features three designer terraced king bedrooms, and marble en-suite bathrooms with glass-enclosed rain showers, whirlpool tubs, bidets, and double vanities. The estate also includes a home cinema with an 85-inch LCD TV, a state-of-the-art fitness center with a yoga room, a private spa room and two hot tubs, a business center, a spacious dining room with a gourmet kitchen, and separate living areas for a personalized butler and nanny. To book this once-in-a-lifetime experience, click here. The St. Regis Maldives Vommuli Resort offers guests an exquisite epicurean journey with no less than six restaurants and two bars where culinary experts showcase their exceptional talents by crafting globally-inspired dishes using fresh seafood and locally grown produce as well as serving top-shelf libations in an array of sophisticated settings. Floor-to-ceiling windows embrace spectacular views at the signature restaurant, Alba, where guests can savor delectable Italian cuisine while soaking up enchanting ocean and pool views from the airy open kitchen or enchanting terrace. The venerable Decanter presents a five-course degustation menu paired with seven complementary vintages hand-selected by our professional sommeliers for wine-lovers and aficionados. Orientale boasts three elegant open kitchens, where legendary chefs serve authentic Asian delicacies right next to the ocean, while guests can customize their pizza creations with traditional and local ingredients at Crust. Cargo is a modern, pop-up diner that serves up gourmet street food amid the lush foliage of the tropical gardens and the whimsical over-water Whale Bar whose distinctive shape recalls the majestic whale shark serves delightful tapas and tantalizing cocktails in an architecturally award-winning setting. Boasting white oak floors, floor-to-ceiling windows, a lively central show kitchen, and a picturesque terrace, the resort’s signature restaurant presents reinterpreted traditional Italian dishes, delectable breakfast specialties of foie gras terrine, white asparagus with fried polenta, and poached eggs with orange hollandaise and black truffles. The elegant dining room also has a separate island kitchen, and a refined bar encased in natural oak, and Alba’s knowledgeable sommelier recommends top-shelf labels from a collection of renowned vintages. Featuring a patio-style setting right on the beach, Crust is a family-friendly pizzeria that serves thin-crust pizzas with inspired toppings cooked to perfection in the outdoor pizza oven, and sandwiches and snacks are complemented by cold draft beers and fresh juices. Boasting a tranquil setting of white oak and sleek gray décor, Orientale is a beautifully appointed restaurant with three distinctive show kitchens, a partially enclosed dining room and open-air terrace and unfettered views of the ocean. Orientale serves exquisite Asian cuisine ranging from tantalizing sushi and sashimi, charcoal-grilled yakitori and an extensive collection of renowned sakes to delectable curries and biryanis, and a curated selection of Korean, Sichuan, and Cantonese dishes. 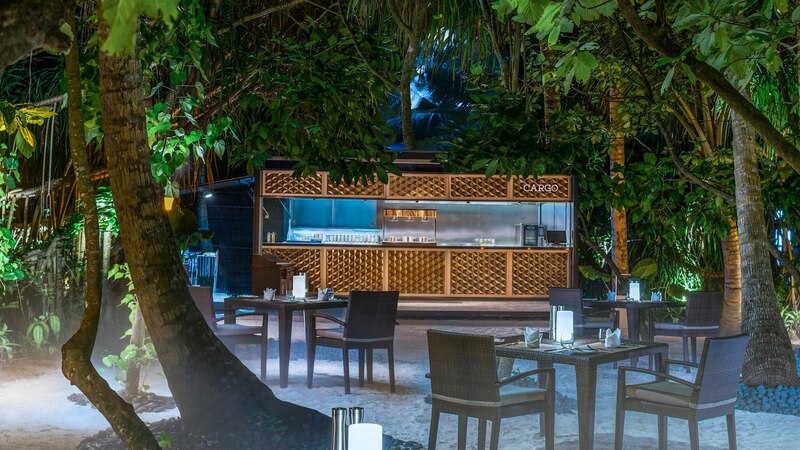 Set amidst the island’s tropical gardens, Cargo is an intriguing kiosk that serves delicious Middle Eastern cuisine such as shawarma, falafel, lamb shuqaf, and homemade dressings and spices. 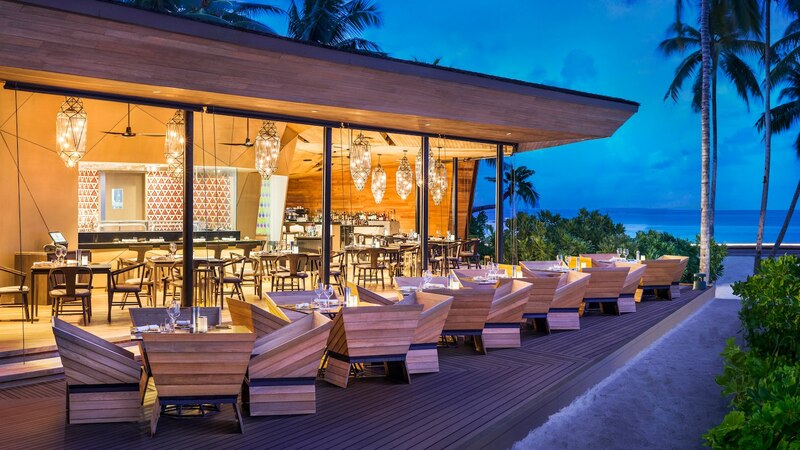 An architectural gem of a marine-inspired design, The Whale Bar is an overwater lounge that serves delectable tapas and locally sourced seafood as well as hand-selected wines and spirits against a backdrop of enjoying panoramic ocean views. 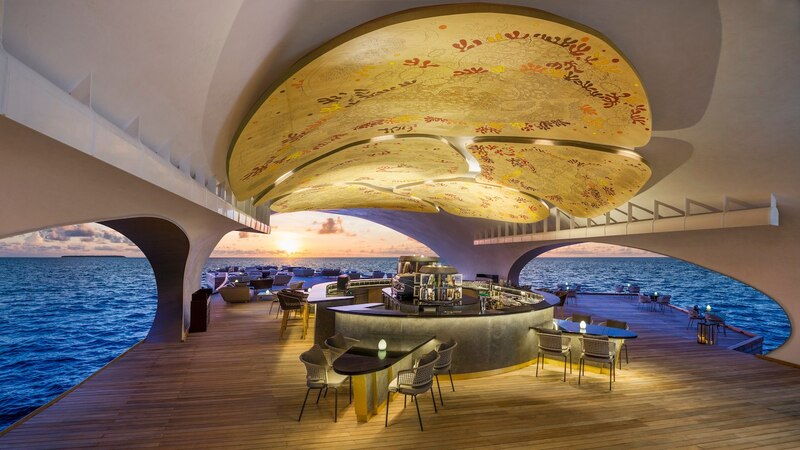 The Whale Bar’s distinctive shape recalls the majestic whale shark and features light oak interiors, a refined bar, and a pyrographic masterpiece on wood by renowned artist Maya Burman depicting a celebration of the Maldives’ vibrant sea life. 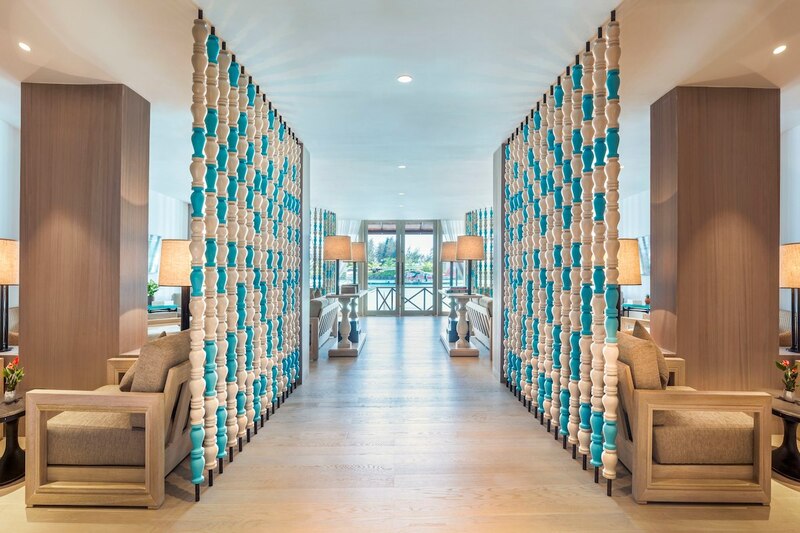 The distinctive lounge opens directly onto an open-air terrace, where plush sofas and armchairs offer an elegant spot to sip on an Island Mary, the resort’s signature interpretation of The St. Regis Bloody Mary tradition or enjoy an iconic Medusa hookah. Decanter is an opulent underground wine cellar that serves an exquisite five-course continental menu with carefully curated vintages. 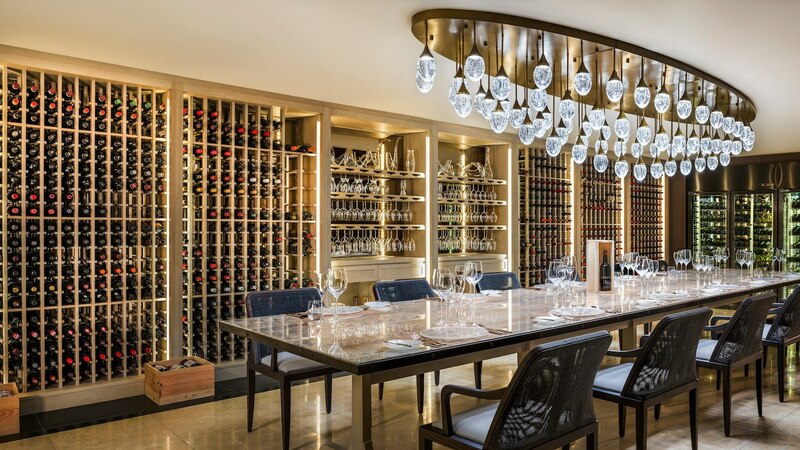 Adorned by white oak wine racks housing thousands of renowned vintages, this venerable space features an elegant Italian marble table accommodating 12 guests as well as ample additional seating. The award-winning Executive Chef prepares a customized five-course degustation menu, and distinguished sommeliers recommend seven perfect pairings from a sophisticated collection of varietals and champagnes. The signature Iridium Spa is a 1,850-square-meter overwater sanctuary that promises a transformative journey in an oasis of tropically inspired sophistication. 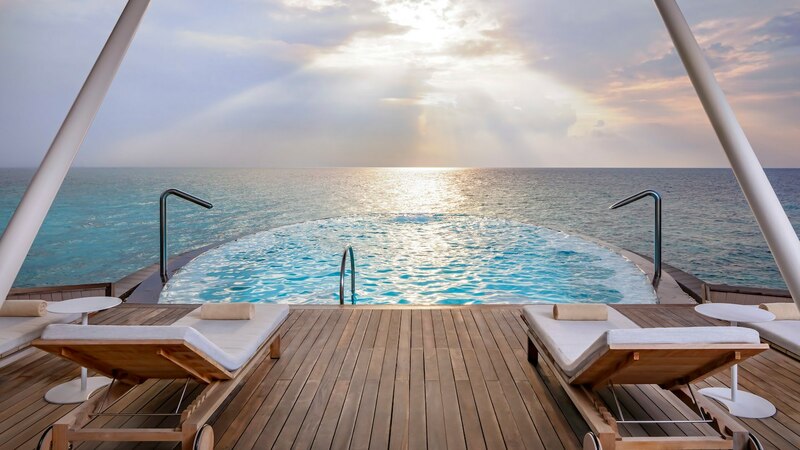 Floating over the ocean, the spa features six couple’s treatment suites, including two Ayurvedic suites with private steam rooms, and private terraces with soaking bathtubs and commanding picturesque ocean vistas. 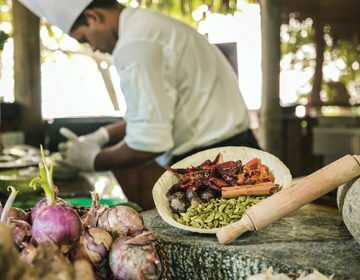 Resort guests receive a complimentary 15-minute Ayurveda consultation and treatments ranging from Balinese and Thai massages to herbal body scrubs to facials, manicures, and pedicures are enhanced by hand-selected Natura Bissé products. 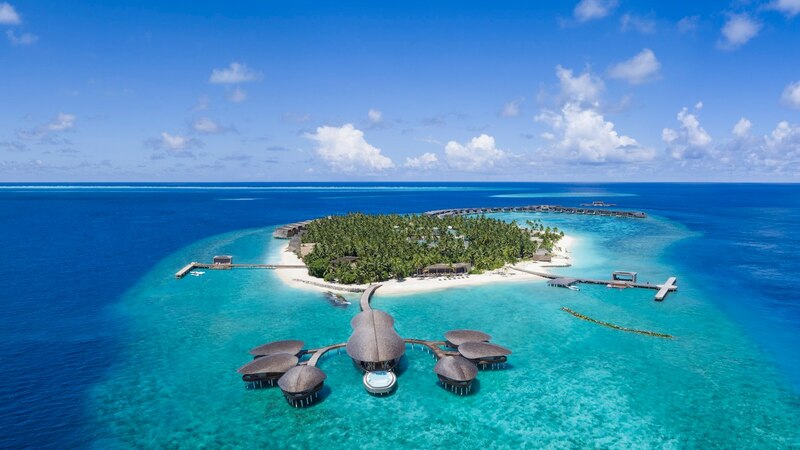 The St. Regis Maldives Vommuli Resort offers a range of world-class outdoor recreation from snorkeling and scuba-diving on the private house reef and the amazing Blue Hole to deep-sea-fishing and kayaking excursions. Learn how to dive at the resort’s 5-Star PADI IDC Dive Centre, which offers tailored programs for all abilities and specialty courses led by the country’s most experienced instructors. Take an unforgettable trip on a traditional dhoni with the resident marine biologist and swim with whale sharks, an experience that will leave you with lasting memories for a lifetime. 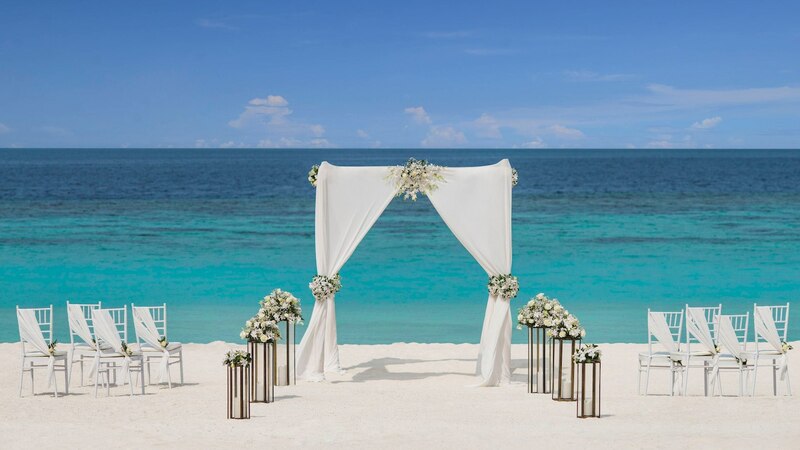 Could there be a more beautiful place to exchange your wedding vows than on a white sandy beach bordered by swaying palms with a backdrop of shimmering, gin-clear water? 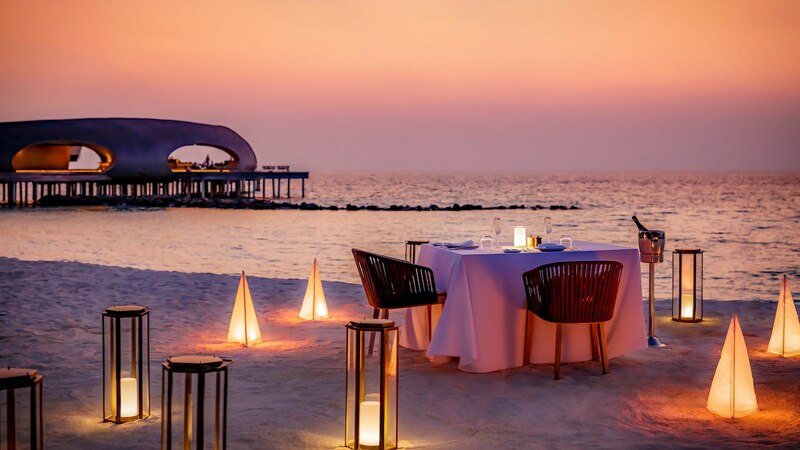 The St. Regis Maldives Vommuli Resort offers a spectacular setting for romantic weddings with a stretch of desert beach to call your own and intimate ceremonies steeped in island traditions. In true island style, the groom and bride are blessed with a shower of colorful and fragrant flower petals as they walk down the aisle to the sound of Bodu Beru drums. 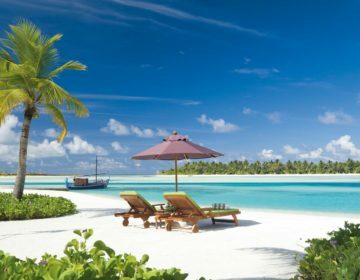 The St. Regis Maldives Vommuli Resort has a variety of fun-filled activities for the whole family to enjoy. The resort has an exclusive children’s club called the Children’s Club, which offers children between the ages of four and 12 years an opportunity to explore the many delights and wonders of island living under supervised care. Led by a team of highly trained childcare professionals, kids are shown the rich culture and spectacular natural beauty of the island, as well as given a chance to enjoy some high-energy sports and outdoor activities, ranging from art classes and treasure hunts to snorkeling and yoga lessons. Families can also enjoy unforgettable expeditions such as dolphin cruises and traditional sunset fishing excursions.